I’m struggling to think of an episode of American Dad in the past few years that I’ve disliked as much as I did “Kung Pao Turkey.” The logline of Stan wanting to watch football all day on Thanksgiving could have yielded such a simple machismo-driven episode, but instead it’s wall-to-wall racial stereotypes and Stan indulging the worst parts of his character. On what Stan believes is the first Thanksgiving in years without entertaining extended family members, he plans to watch football for the entire day in his underwear with Klaus (who apparently loves football but doesn’t get the “U-S-A!” chant). The idea of watching every single bit of the extended telecast doesn’t get fleshed out, but the little throwaway lines (“Both teams have almost completely checked out of their hotels!”) are the best parts of the episode, mocking modern institutions of American Thanksgiving. But Stan busts out a Native American headdress, face paint, and strips down to burgundy underpants after less than a minute. This episode had already been produced before the most recent cycle of public outcry over the name of the Washington NFL franchise, the remaining NCAA programs and high schools still using Native American nicknames and iconography. The problem with “Kung Pao Turkey” is that it doesn’t focus enough on the football, instead casting Stan in a convoluted parallel to the pilgrims/natives at the first Thanksgiving, with Francine’s parents as his opponents. Most sitcom characters dislike their in-laws, some even enough to suggest they “eat alone in the garage out of trash bags and use the neighbor’s bathroom” like Stan does, but opening the door to near-constant Asian jokes on top of the already tenuous Native American material knocks the episode down several pegs. Stan is often a selfish jerk, but he’s usually held in check by another character. Not tonight, as he whines about Bah Bah destroying the television, plots with Klaus to kick Francine’s parents out of his house, and then embarks on an odyssey in search of a place he can celebrate Thanksgiving by only caring about football in peace. 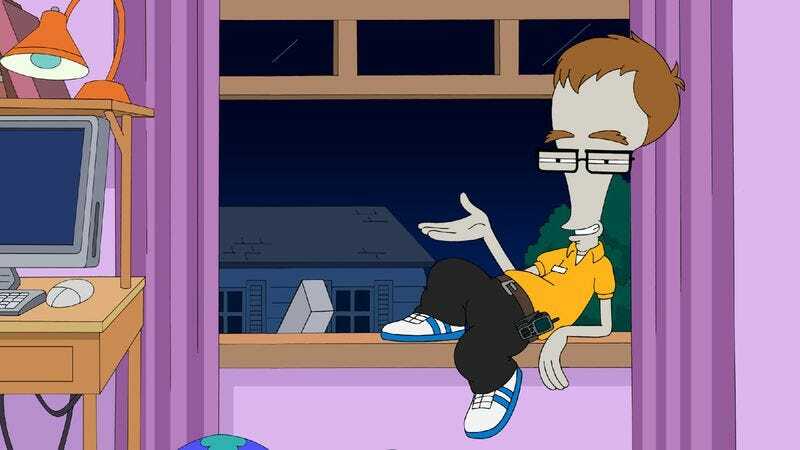 Roger shows up in character as a member of the “Nerd Squad” to fix the television, and for a brief respite, the racial humor gets drowned out by Roger’s commitment to playing “Todd,” a guy who has his own family he wants to be with on Thanksgiving. The monologue he delivers selling “Nerd Squad” without realizing his toolbox actually says “Nerd Brigade” is the highlight of the episode simply because it has nothing to do with the rest of the episode. The B-plot with Ma Ma Ling and Hayley isn’t any better. It tepidly goes through the motions of getting Hayley to throw out all of Jeff’s stuff that she’s still holding onto (the episode where Jeff hopefully returns can’t get her soon enough) while Ma Ma encourages Hayley to move on to someone else, then decides she’s attracted to the candidate she’s chosen and tries to compete with Hayley for his affection. Which is then completely disregarded with a kicker where Roger shows up as Trevor again that feels entirely appropriate for such a discombobulated and (again) unfunny subplot. I don’t want to come off as overly sensitive. Amid the montage of Stan’s ignorant attempts to scare his Asian relatives out of his house (dressing up like Godzilla even though they’re Chinese, or buying a horse to help with his Ghost Genghis Khan), there are a few tossed-off lines that made me smile. And the idea of finding such welcoming Cowboys fans is a hilarious unintentional joke. But the reason this episode is so disappointing isn’t because it spends most of the running time insulting two Asian immigrants or dressing Stan as an obvious caricature, but because none of the jokes going for racial humor in the episode are funny or clever in any way. They’re just meant to be provocative. This is the kind of deliberately line-pushing offensive humor that serves very little purpose. A few lines at the very end of the episode espousing tolerance and fellowship don’t retroactively reframe all the previous jokes as winking irony. A wrap-up lesson that people should “accept everyone, no matter team colors or skin color or how horrible they are,” should not make anyone want to forgive Stan after he’s been a colossal jerk the entire time. I’ve never been this disappointed by an episode of American Dad. The delayed Christmas special can’t come soon enough to wipe any memories of tonight’s episode away forever. Does the Fox NFL Sunday robot waking up Jimmy Johnson count as a cutaway? Klaus’ final lines to close out the episode essentially mimicked my exact reaction to Stan driving to the Washington football stadium. That and Roger’s disguise saved this episode from F territory.